Pearls are categorized and sorted based on 7 value factors: size, shape, color, nacre, luster, orient and surface quality. Nacre and luster are the most important indicators of quality; however, most people do not understand what nacre is. Nacre is the hard, iridescent coating that oysters (and some mollusks) use to line the inside of their shells. Nacre is also what pearls are made of. Nacre quality is evaluated by examining layer thickness and layer density. Since the average person is usually not able to determine nacre quality, the most important factor to understand is luster, which can be easily seen by the naked eye. Pearls with high luster have a mirror-like sheen which sharply reflects images around them. High luster pearls exhibit a deep inner glow along with a brilliant display of various surface colors known as orient that is highly prized in high quality pearls. Low quality pearls are more commonly dull, chalky and lifeless. Luster relates to the reflection and refraction of light as it passes through layers of aragonite platelet crystals that form the nacre of a cultured pearl. The intensity is determined not only by the amount of crystals but also the specific geometric pattern and regularity in which that are secreted on the nucleus by the mollusk. Several factors affect nacre secretion, determining the intensity of luster. 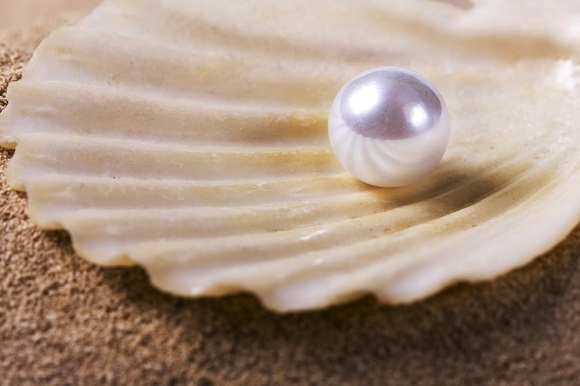 The health of the oyster, water temperature and the amount of nutrients available to the oyster all play a crucial role in the formation of a pearl with exceptional luster. It is commonly believed that the intensity of a pearl’s luster can be an indicator of nacre thickness and determinant of the durability of a pearl. This correlation is not always true. Cultured pearls with very thick nacre combined with poor density will result in mediocre luster which is more a result of the arrangement of aragonite platelets. Platelets formed in warmer waters have a more loosely structured formation which are unable to refract and reflect light as well as the tightly packed platelets found in higher density nacre. The waters in which the Japanese Akoya oysters are farmed are much less polluted and subject to broader seasonal changes in water temperature. Pearls cultivated in colder waters are formed with a more tightly packed crystalline structure because the cold water slows down the nacre secretion process reducing the size of aragonite platelets and producing tighter more densely packed nacre layers. Japanese Akoya saltwater pearl farmers conduct their harvest only once a year in the freezing winter weather to ensure the cold-water pearl coating is at its optimum. Ideal temperatures and minimal pollution produces fine quality pearls with a mirror-like luster such as the Japanese Akoya Saltwater pearls. Nacre’s iridescence is caused by aragonite, a calcium carbonate material. Layers of aragonite stuck together at nearly the same distance as wave lengths of visible light, cause different colors of light to be reflected from different viewpoints. If nacre is thick but not highly translucent, uniform or well aligned, it’s not high quality. It might be durable but it will lack superior luster. Nacre density is a result of the formation of aragonite platelets. Platelets which have been loosely formed cannot reflect and refract light as well as tightly packed platelets. Pearls cultivated in warm waters tend to have a more loosely packed platelet structure than pearls cultivated in colder waters such as the Akoya pearls used in all Add-A-Pearl Necklaces. Pearl bearing mollusks are sensitive and their stability is easily upset. They produce the highest quality pearls when their environments are stress-free and with minimal pollution. Pearl farmers strive to create and maintain those circumstances for their mollusks because they know the payoff is better quality pearls.